Immunogen :CyclinO antibody was raised against a 14 amino acid synthetic peptide from near the amino terminus of human CyclinO. 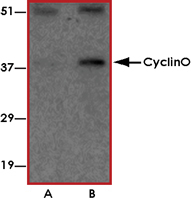 Sample Data :Western blot analysis of CyclinO in mouse bladder tissue lysate with CyclinO antibody at (A) 1 and (B) 2 ug/mL. 1. Roig MB et al: Identification of a novel cyclin required for the intrinsic apoptosis pathway in lymphoid cells. Cell Death Diff. 2009; 16:230-43. 2. Muller et al: Isolation and characterization of a human cDNA encoding uracil-DNA glycosylase. Biochim. Biophys. Acta 1991; 1088:197-207. 3. Muller SJ et al: Cell cycle regulation of a human cyclin-like gene encoding uracil-DNA glycosylase. J. Biol. Chem. 1993; 268:1310-9.